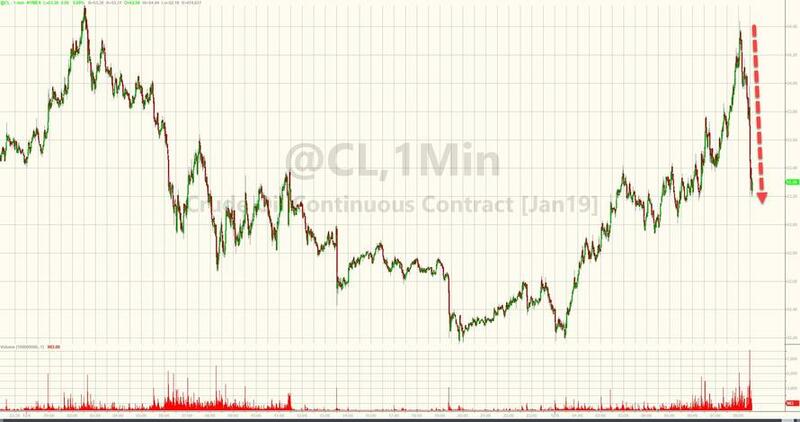 Despite the desperate headline-grabbing jawbone attempts (from Oman's delegate more than others), WTI Crude prices are tumbling from earlier highs as day one of the OPEC+ meeting ends without a firm commitment to further production cuts. The meeting of Saudi Arabia, Russia and other members of the OPEC+ group recommended a production cut, without a formal agreement on how much oil should be removed from the market. All sounds very bullish - except nothing was agreed at all as the Russian delegate confirmed, talks with fellow OPEC+ members were constructive but the result will be discussed at the OPEC conference in Vienna on Thursday. Any concrete moves will depend on the outcome of that meeting, the delegate says, asking not to be named because the talks were private. But, once that same Omani delegate suggested that the cuts - which have not been agreed - could be 1mm b/d only, crude prices began to tumble. Expectations are for a cut of 1m-1.3m b/d, B. Riley FBR Chief Market Strategist Art Hogan says at Energy CFO Roundtable in Houston.